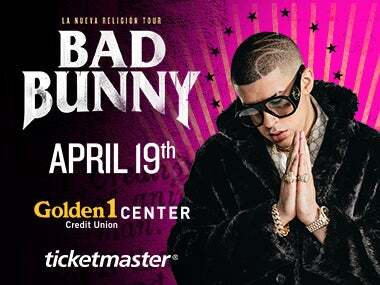 Sacramento, Calif. – Latin trap and reggaeton sensation Bad Bunny extends his La Nueva Religion Tour for a performance in Sacramento at Golden 1 Center on Thursday, April 19. His first North American tour builds on the success of 2017, where he had fifteen singles on Billboard’s Hot Latin Song chart. At the end of January, Bad Bunny appeared on three tracks on Billboard’s Hot 100 list. Tickets will go on sale beginning Friday, February 9 at 10 a.m. at Ticketmaster.com. Fans can take advantage of a special pre-sale opportunity beginning Thursday, February 8 at 10 a.m.
Read more about Bad Bunny in Billboard’s 2018 music preview.